I know a lot of us love the idea of living a simple life. I fell in love with the concept the minute I discovered it. To me simple living meant less to do, more time to enjoy life, less to worry about.. It was about letting go of being 'busy' and enjoying a slower pace. It was a beautiful idea and I wanted it to become my new reality immediately. No more rushing and hurrying, no more barking at my children to get ready quickly, no more competing with others on 'who was the busiest'. I couldn't wait to feel at ease, rested, relaxed and peaceful with my new lifestyle choice.. But I remember how stressful it was when I first started thinking about simplifying my life. The whole thing was too overwhelming. I had no idea where to start. I felt like I needed to simplify everything and I needed to simplify fast! This just made me feel more busy and stressed than ever - the opposite of what I was aiming for. So started with just one small step, one way to simplify, and once I got used to that change, I moved onto the next. Then the next, and the next - never moving on until the current step had become more of a habit. I still have a fair way to go, but life now is quieter, more peaceful. I'm slowly giving up the reward of doing 'busy' well. Even my organising tasks are focused on freeing up my time rather than being able to squeeze more into my days. I love this change and the effect it has had on me as a mother and a person. If you want to simplify your life and you're feeling overwhelmed at the idea, I have a list below of what I started with - you can try it if you like! Let me know how you go. 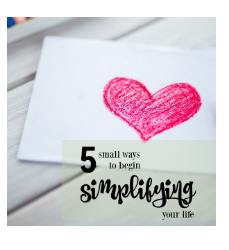 5 small ways to begin simplifying your life. 1. Declutter one bag of something from your home each week. Clothes, toys, expired pantry goods - your choice. Throw it out, give it away, sell or donate. 2. Limit your daily To Do list. I used to say "Eight items, max or you'll always feel guilty about not finishing your list." Now I say three. Sometimes, one. 3. Shower at the same time each day. Once you develop a pattern, everyone in your house will just accept it as the new norm. Now you never have to fit it in around the kids. I shower at night and enjoy my time under the hot water when my thoughts are my own. 4. Put your phone away when you want screen free time. Have as much screen time as you want, but when you feel like you should take a break, don't just put it down. Put it away - in a drawer, or in your bag, so you're not tempted to 'just pick it up and quickly check it' and get stuck on it for another half hour. 5. Add buffer time to everything you commit to. If you know school drop off takes from 8.30am to 9am, don't schedule your next task for 9.30am. Give it at least an extra half hour so you don't have to rush from one thing to another. If you have arranged to meet a friend for an hour, schedule it into your calendar with buffer time on each side so you have plenty of time to get ready, drive, park, walk from your car to your meeting point. If you think it will take you 15 minutes to drive somewhere, give yourself a half hour to do it. Now you can slow down, and you'll feel less stressed and less busy. 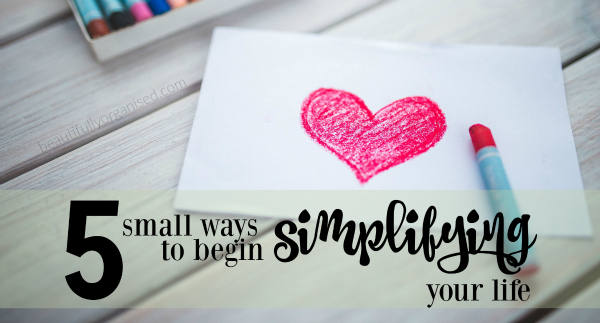 If you have any other ideas on simple ways to simplify, I'd love you to share them with us below or on the Facebook page. Your tip could be the one that really helps another busy mum to not have to be so busy anymore.